Maddox Gallery is pleased to present ‘The Coronation,’ a vibrant exhibition of stunning new works by New York based artist Bradley Theodore. Over the past three years, Theodore’s meteoric rise and vibrant large-scale works have captured the attention of the art world and earned him frequent comparisons to Jean-Michel Basquiat. Now, his latest exhibition, ‘The Coronation’ sees Theodore embark upon a new direction; turning his focus to history’s regal anarchists, this new series alludes to a number of significant, culturally historic moments which Theodore has reinterpreted in his own signature style. Drawing attention to tribalism and the chaos and corruption of modern civilisation, Theodore’s provocative re-imaginings, with their colourful iconography and layered symbols, challenge the viewer to explore a time before Western society ran the world. Interweaving his own interpretations with intelligence and wit, the arresting paintings detail our complex history as a global society and urge viewers to confront what the world’s crowning achievements were once perceived to be, and what they will be in the future based on the actions we collectively make today. The new paintings were created after the artist travelled across the world for twelve months, painstakingly collecting pigment for his colour palette. They add an atmospheric and abstract layer to instantly-recognisable imagery and capture the self-awareness and self-preservation of some of history’s most renowned characters in an entirely modern way. 'The Coronation' is a vehicle for narrative, history, sentiment and symbolism by one of the most exciting artists working today. This is Maddox Gallery’s third exhibition of Theodore’s work following a 2017 show in London, and his first solo exhibition in the UK in 2016. The exhibition is comprised across two floors of the gallery’s flagship Mayfair townhouse location, with over thirty new works (including works on paper) and the remaking of an experiential installation in the lower floor of Maddox Gallery. 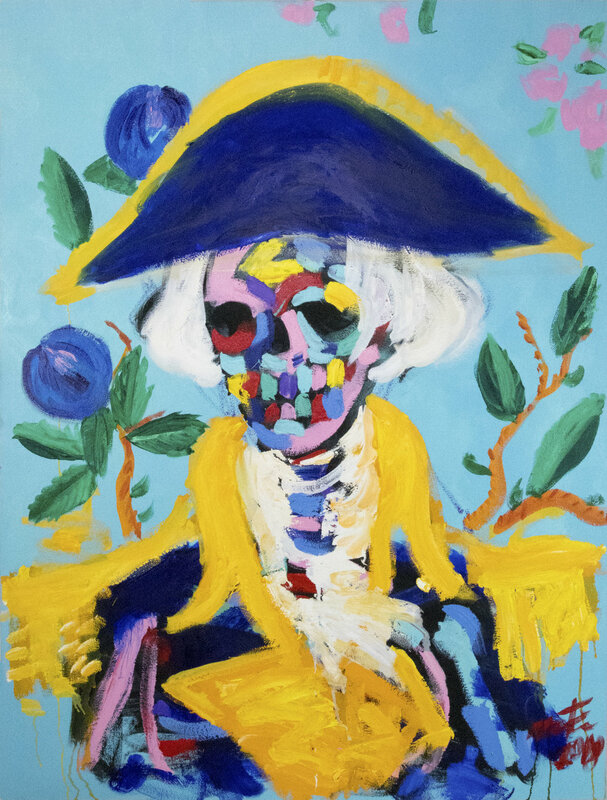 Maddox Gallery will also release the first limited edition print by Bradley Theodore to coincide with the opening of The Coronation. A numbered edition of 100, the print will launch on Monday 1st October at 11am GMT and will be priced at £3,000. The print will be available at 9 Maddox Street, the Editions Gallery in Shepherd Market and online here.